Star Trek has never been one to shy away from getting political, and even though some of the subtext here may be coincidental, this week’s Star Trek Discovery delves deeper into the political theatre that is the Klingon clans. It is hard not to hear the Klingon cries for ‘Remain Klingon’ and then witness leadership contentions within their ranks and not think of the current climate within British politics in particular. It places Discovery as a show with more pertinence than perhaps initially expected from its high-gloss, visual effects-laden packaging. But as it stands, the Klingon sub-plot, which gets given a fair share of the run-time this episode, is packed with political intrigue, deception and struggle, allowing for Discovery to continue to thrive as a show that aims to offer unique insights into familiar aspects and archetypes of the Trek-verse. While unrest is rife amongst the Klingon clans, their warfare with the Federation rages on, with the planet Corvan II under heavy attack. This planet holds great significance as it is responsible for providing 40% of the Federation’s dilithium crystal supply, the key ingredient for warp travel. The Discovery is called upon to make an experimental jump across space using the ‘spores’ technology that they have been developing in secret. 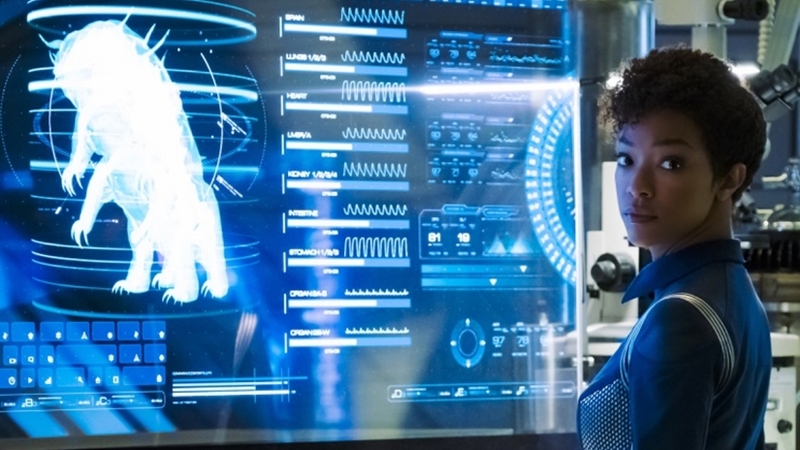 It falls to Michael (Sonequa Martin-Green) to unlock the secrets behind the creature found on the destroyed USS Glenn in last week’s episode, and how it could hold the key to navigating anywhere in space in an instant with the use of mysterious spores (the Spore Drive). Michael’s task to understand this supposedly vicious creature brings in an ethical debate of animal rights, as well as emphasising the idea that just because we don’t understand something doesn’t mean it is dangerous. Michael’s study and subsequent bonding with the creature demonstrates where some further conflict may arise in the future, as this creature holds the key to how the spore drive can operate, but at a seemingly painful cost to the creature (nicknamed Ripper) itself. The Butcher’s Knife Cares Not for the Lamb’s Cry (what a title) paves a lot of the groundwork upon which we can expect certain frictions to occur within the series, as well as addressing themes and concerns that feel very in key with the probing philosophical concerns of the Trek series in the past. We also see the strain that this war is having on the Discovery ship herself, a ship (and crew) designed to be a science vessel suddenly thrown into position as the potential key to winning a war. It lays a lot of intriguing groundwork that makes the case for the series as a whole. Something I haven’t really touched on so far in these reviews is the darker, grimier vision of the future that Star Trek Discovery exhibits. While everything is clean and glossy on the production value front (perhaps a little too much, considering this is supposed to be set 10 years before The Original Series), the nature of the show is definitely much more adult than we have previously seen in Trek. This is particularly true in regards to violence. There was a rather gratuitous death in the last episode, and Choose Your Pain keeps up this level of violence as Captain Lorca (Jason Isaacs) is captured by the Klingons, leading to Saru (Doug Jones) taking command and Michael fighting for the rights of the Ripper creature. There is much to appreciate in this approach; it’s clearly an attempt to get further viewers beyond the Trek devotee who may have written off Star Trek in the past for being a bit toothless. But it does also threaten to alienate. This episode touches on some dark corners as we enter the dungeons of a Klingon vessel, and while the first F-bomb in Trek is delivered with glee, it doesn’t stop it from feeling just a little bit jarring. That being said, Choose Your Pain, does fine work in developing individual characters and relationships upon the ship. Isaac’s Captain gets given some welcome back story, allowing him to come across as a more emotional individual than initially anticipated. We get more of the great Anthony Rapp as Stamets, delving into his relationship with on-board Dr. Culber, the first gay relationship we’ve seen on-board a vessel in Star Trek. This episode also has a fantastic performance form Doug Jones as Saru, a man whose performance I have not discussed nearly enough in terms of how wonderfully alien it is and how composed and expressive he manages to be, despite the heavy prosthetics. 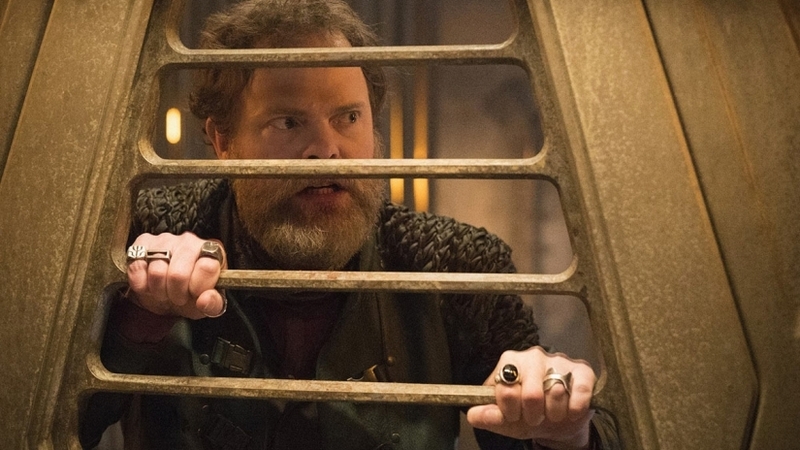 Choose Your Pain also has a very direct link to the original series in the form of a character once seen back in the Shatner days, Harry Mud, here played by Rainn Wilson. Wilson pays homage to Roger Carmel’s performance in the original series, demonstrating the deceptive nature of the character, as well as showing signs of vulnerability. It is Michael herself who gets a little lost this time around, with the episode relegating her to being shut in a room for the most part of the episode. I hope this won’t be too much of the case going forward, as Martin-Green’s performance has been the tortured soul at the centre of this show, and one of the main reasons that Discovery is coming back to each week. Star Trek: Discovery is currently available to stream on Netflix, with a new episode arriving every Monday.